CONWAY, SC--(Marketwired - June 19, 2015) - The past two years have proven to be instrumental in the success and growth of 27 year old Colors on Parade. After the economic recession in 2009, Colors on Parade needed a new strategy and focus in order to survive in a struggling automotive industry. A family focused value system, grassroots sales efforts and building solid relationships have been the key factors in Colors on Parade's ability to rebound from this economic downturn. 2014 reported the company's highest growth in years including 27 new franchises, two area developers and its first international expansion. With new area developers in New Jersey, California and Utah, new franchisees across the United States and an international partnership in Colombia South America, Colors on Parade is growing by leaps and bounds. This mobile automotive repair franchise is excited about its growth in the past year as well as the many opportunities on the horizon. Once the pilot program is complete in Colombia, Colors on Parade expects growth across South America over the next two years. In addition, the company expects to have area developers in every state in the United States within the next five years. Over 27 years of experience and close to 300 units is a strong business, but in the next ten years, Colors on Parade expects to become a household name. Colors on Parade offers ecosmart, quality, convenient and affordable automotive paint and dent repair. 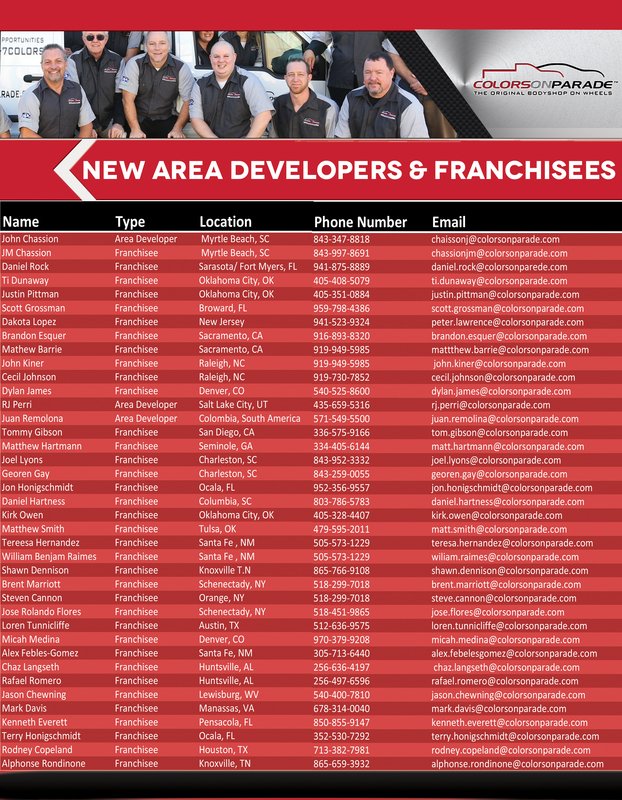 Its franchisees serve the retail market, automotive dealerships, fleets, rental car agencies and many other customers across the United States. "The market has barely been tapped when it comes to our industry; I love the growth we are seeing. 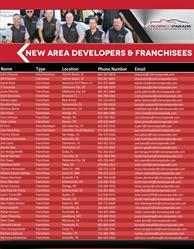 The excitement within the company is contagious, everyone's business is booming from the one man franchisee to the area developers and corporate office. Anyone that wants to own a business with a proven model and great technology can have success with in the Colors on Parade Family", says Jeff Cox, President and CEO, Colors on Parade - Total Car Franchising. In March 2015, Colors on Parade held its national convention in Breckenridge, Colorado. Over 150 business associates were in attendance including area developers, franchisees, employees and corporate staff. Colors on Parade hosts this event annually, with this year yielding the highest companywide participation in years. This excitement and energy is a direct reflection of the amazing results reported at the convention. These results are a direct reflection of Colors on Parade's new focus and sales strategy. In short, the corporate office decided to get back to basics. With this decision made, the focus became people - people create relationships, solidify grassroots efforts and find the right partners for growth. Colors on Parade is a family owned company and its success goes back to entrepreneurs buying a franchise and running it as a family business. The "people" focus in sales revolves around the basic family values of honesty, caring and hard work. "Being part of the Colors on Parade family is an honor. I love seeing individuals launch a small business, passing it on to their children and helping their local communities. I love seeing a customer drive away with a beautiful car - all the blemishes gone. I love being part of something that is growing and that is honest and is a real American Dream come true. Connecting with peers in the industry, end users and new business owners keeps me motivated. I expect my team to be themselves with sales leads, we are looking for partners, not just sales," says Claire Garstka, Vice President of Marketing and Sales, Colors on Parade. The sales and marketing team is connecting emotionally with partners and customers. They understand the needs of business owners and retail customers alike. Participation in industry events and associations has been key to these relationships. The new focus doesn't end at the corporate office; area developers are impacting their local communities through associations, partnerships and volunteering. Training on brand position, grassroots sales and relationships has been the focus of the past three area developer conferences. All aspects of the Colors on Parade business have been positively affected by the new sales and marketing focus. By the end of 2015, Colombia South America will be in full operation and Colors on Parade will have a presence in over 28 States. Colors on Parade has taken the time to understand the needs of its customers, partners and business owners. A company that has gone back to basics, stuck to a solid value system and pushed through by focusing on people has successfully survived the downturn in the automotive industry and is now enjoying the renewed growth. To find a franchise near you please visit www.colorsonparade.com. Franchise opportunities still remain available throughout the United States. Information about franchising opportunities can be found at http://www.colorsonparade.com/franchise-opportunities/. Colors on Parade was founded in 1988 by Robert Lowery to service the automotive industry with body shop quality repairs from a mobile unit. The company originated in Conway, S.C., and has since expanded, with franchises in 28 states. Colors on Parade uses eco-friendly technologies to provide mobile onsite auto repair services at any location including a client's home or work. The services include the repair of paint scratches, scrapes, dents and dings, as well as paintless dent repair. Its customer base includes car dealerships, fleet owners, rental car agencies, body shops and individual vehicle owners. For more information about Colors on Parade, visit www.colorsonparade.com or call 1-800-7COLORS.